It may not occur to us that our computer, printer, music dock, TV, refrigerator, lawn mower or chainsaw – and above all our car – may be produced in a factory in Turkey. We tend to associate Turkey with beaches, tourist attractions and family holidays. However, tourism is far from being the number one contributor to the Turkish economy. This place is taken by industry that is making and exporting industrial goods such as cars and car parts, industrial machinery, construction machinery, electronics, textiles – and a great number of other products originating in the industrial heart of the fast-growing Turkish urban centres. We should know this in the EU as the EU is by far Turkey’s biggest trading partner, with Germany at the forefront and Italy, the UK, France and other EU countries right behind. The EU accounts for more than half of Turkey’s trade, both exports and imports, and in spite of the size of this trade, it is remarkably resilient. “Even though we saw massive dip in the value of the Turkish lira this summer, we saw a limited effect of this on trade volumes on our ships,” says Niels Smedegaard, CEO of DFDS. DFDS recently acquired the Turkish shipping company UN Ro-Ro, which is the major carrier of goods traded between the EU and Turkey. “Several factors work in favour of stability and growth in this trade. Both partners are strongly interested in growing trade and removing barriers to stimulate it. Furthermore, the biggest trade volume is seen for cars and car parts flowing both ways. Materials and parts go into Turkey for industrial processing and completion – and very often back to the EU to the car plants’ assembly lines. Or the flow goes in the opposite direction with European deliveries of manufactured parts to assembly lines in Turkey and completed cars exported back to European markets,” he says. “Dependency goes both ways, and this is also why we are so confident that volumes will continue to grow for many years. Occasional changes and setbacks may occur, but so many factors work in favour of growth that we believe in long-term growth perspectives for our business in the Mediterranean,” says Niels Smedegaard. He sees the benefit of closer trade relations for Turkey as well as the EU and job creation on both sides. Turkey has a population of more than 80 million people and is the world’s 17th largest economy. Trade and growth derive from its many huge urban centres such as Istanbul with more than 15 million people – like London and Paris put together. 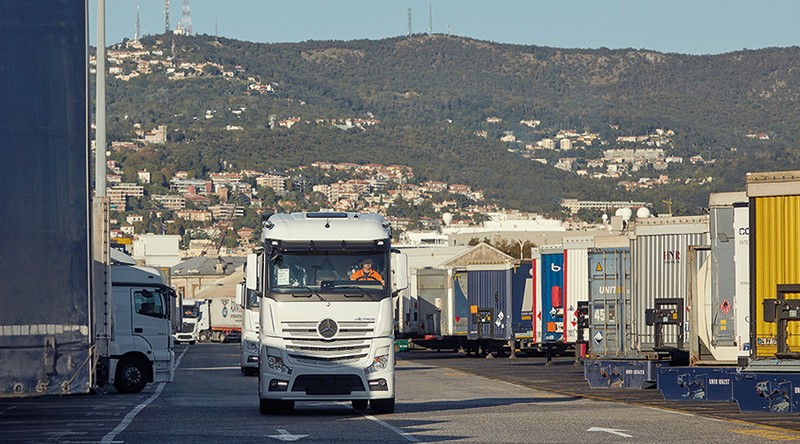 DFDS operates 12 large ro-ro freight ferries in the Mediterranean and transports around 1/3 of all trailers between Turkey and the EU. The ports in Trieste and Toulon are linked to the German industrial centres and cities throughout Europe via roads and rail connections that reach as far as Gothenburg and Oslo.